On my way home this afternoon I stopped to pick up a few Geocaches and at one of the cache locations on Kragga Kamma Road I found this very distinctive bracket fungus growing on the back of the tree. Polypores are a group of fungi that form fruiting bodies with pores or tubes on the underside and is also called bracket or shelf fungi. Their woody fruiting bodies are called conks and they inhabit tree trunks or branches consuming the wood. They are the most important agents of wood decay and play a very significant role in nutrient cycling and carbon dioxide production of forest ecosystems. Over one thousand polypore species have been described to science although a large part of the diversity is still unknown. 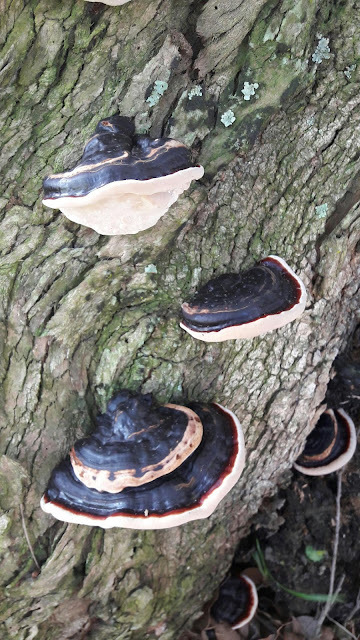 I have seen a lot of different types of bracket fungus ranging from bright orange to brown, yellow, cream and white, but this is the first time I've seen this specific one with the black on top. A find for me just as significant as the Geocache located below them.